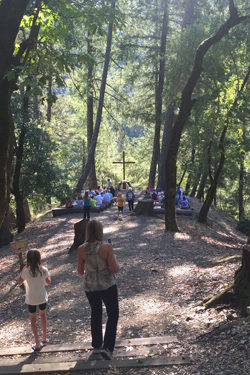 Each fall DCC gathers together as a community of friends and faith in the sacred space of Camp Cazadero. We use this time for rest, spiritual renewal, recreation, and worship among the redwoods. Camp Cazadero is a 2.5 hour drive from DCC, northwest of Santa Rosa near Guerneville. Lodging (cabins with bunk beds, mattresses, bathrooms, and heaters) and meals are provided. Below are the details from 2018. New details and registration will be available in the Summer. If you have questions please email Joyce Klassen. For those attending, please see the helpful documentation below, and happy camping!